Jill in Plano, Texas had a classic 90’s master bathroom complete with wallpaper and carpeted floors. This transformation kept the footprint to save cost, but changed out all of the materials to give her a modern, clean look. It doesn’t even look like same room! The only constructional changes were installing a stand alone tub and expanding the shower a few inches. Read to the bottom to hear about Jill’s experience with Winston Floors + Countertops. Gorgeous stand alone tub install. Charcoal grey porcelain marble shower installation. Q: What was your bathroom like before? A: This was a 90’s era bathroom with carpet, wallpaper and brass fixtures. The spa tub was torn out and replaced and we expanded the shower. We had a plan, but we made changes along the way. Winston Floors + Countertops was flexible and that was helpful. Q: How were the installers? A: Josh and Nelson left it cleaner than it was before! They took care of my house and cleaned up everyday. 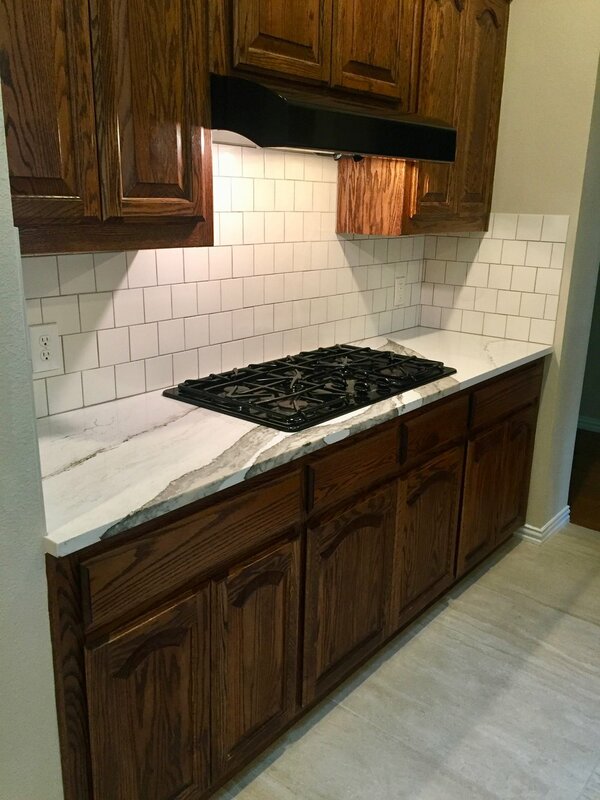 Q: How did you choose Cambria quartz? A: Winston Floors + Countertops helped me. I picked out the floors and you helped me pair it with the counters. Q: What is your favorite part of the project? A: The transformation! You wouldn’t think it was the same room, but it was cost efficient because we didn’t change the footprint. This was a fun project because the customer had her own vision from the beginning! She wanted the space to read “happy” and it does just that! You can’t help but smile when you look at these photos. 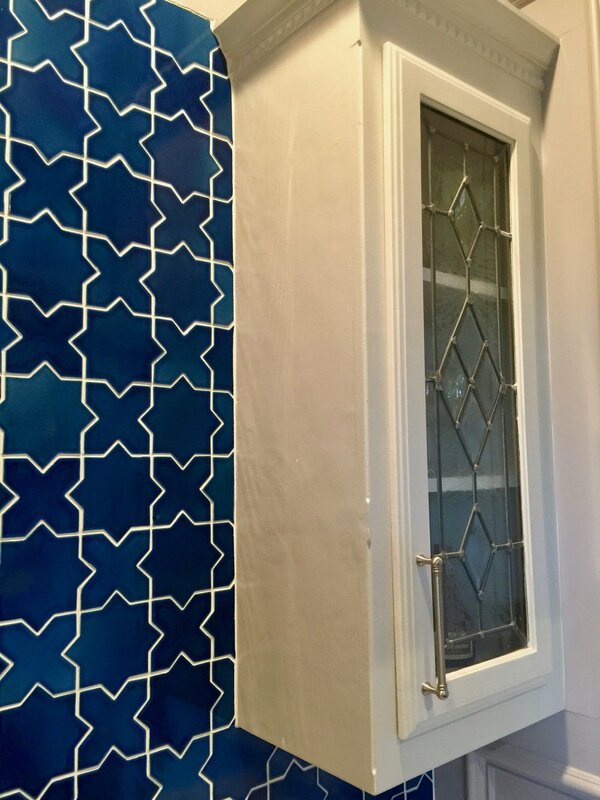 She used Cambria Ella through out with a mix of Fireclay blue star + cross, Kasbah Trellis and her own custom design in the kitchen. Read to the bottom to hear about her experience working with Winston Floors + Countertops! 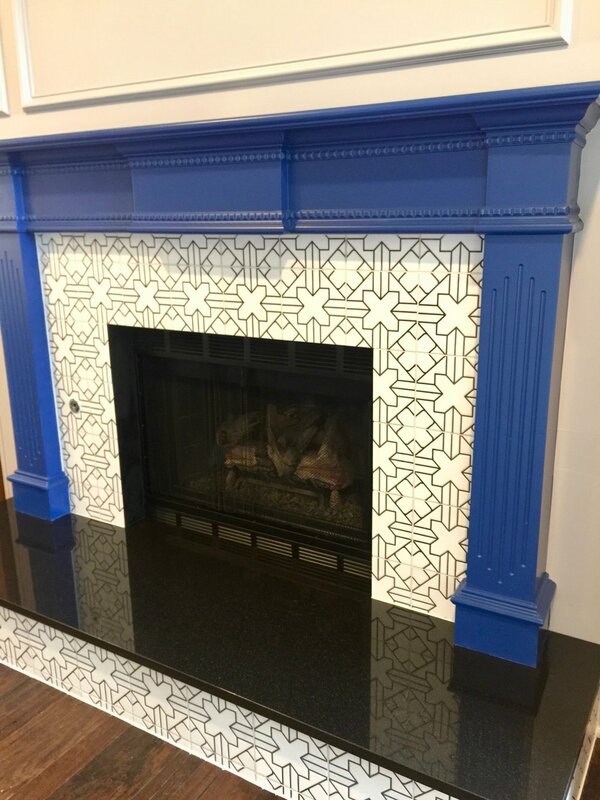 The customer created her own Fireclay Tile design! Fireclay Tile Blue Star + Cross paired with Cambria Ella in the wet bar. Hear what Winston Floors + Countertops customer, Diane Parker, had to say about her experience! Long time customer, Jennifer of Plano, TX, was looking to take her 80's style bathroom to current but classic. Her love of warm tones needed to be toned down with gray to fit today's trends for a possible resale. 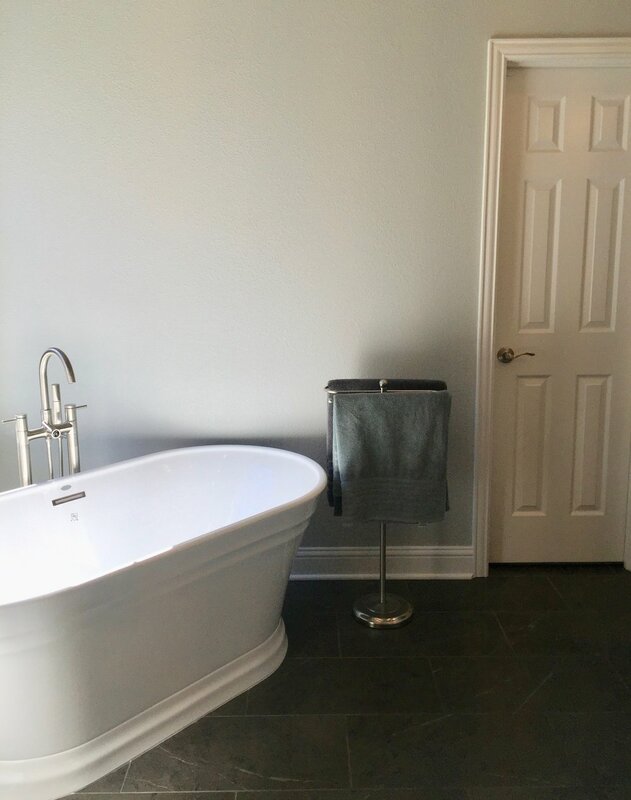 With a love of design, Jennifer wasn't scared of color but chose a base of gray-beige 12x24 floor tile and Cambria's popular Brittanicca Gold. 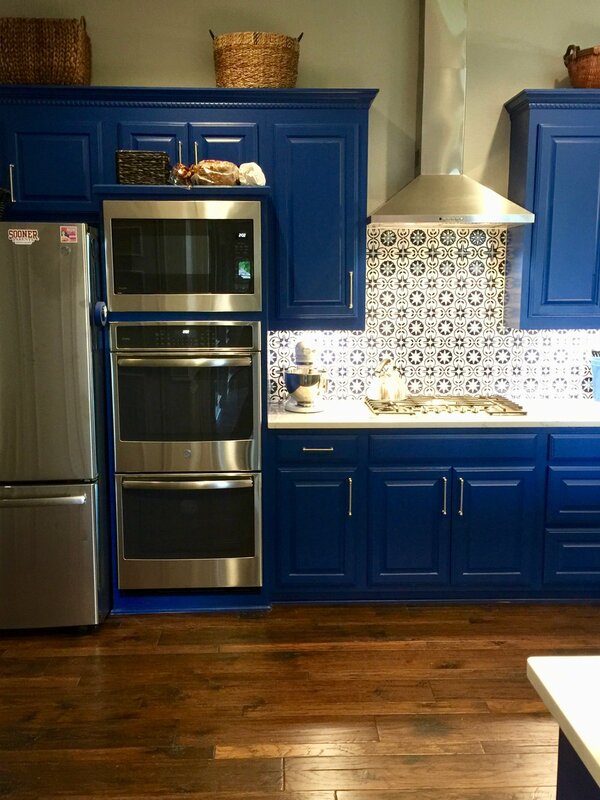 She added color with a red hued glass accent tile that brought out the warm tones in the Brittanicca Gold. 3x3 tile in small shower with blue 12x12 tile on the floors. 3x3 white shower tile replaced with 12x24 tile to match floor tile giving the space a more fluid look. Cultured marble replaced with Cambria quartz and red-hued glass for the 4 inch backsplash. 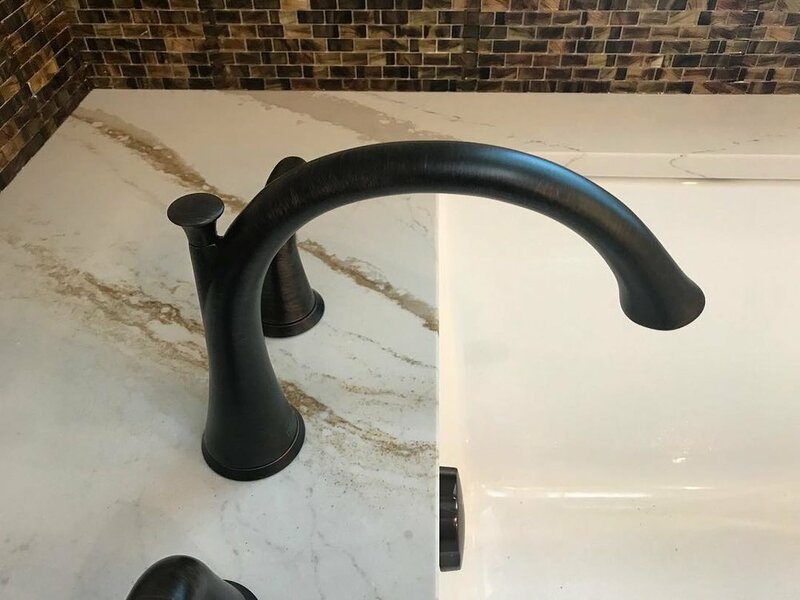 Cambria quartz used on top of under mount tub. Cambria extended into shower structure for a functional seat. We caught up with Jennifer in her home after the remodel and asked her a few questions. Q: What was the bathroom like before the remodel? A: The bathroom before the remodel was stuck in 1986, it was all done in a cultured marble so it still had the shell sinks in both vanities. We had a very old blueish tile, all of the corinthian gold brass fixtures. The tub was actually a sunken tub down into the slab so we had to raise that. The shower was probably half the size it is now and a 3x3 white tile. 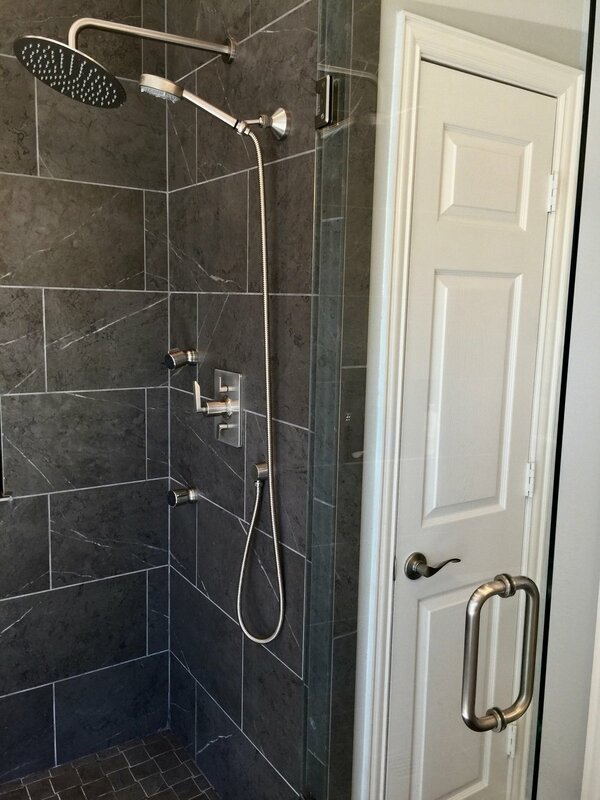 Q: Why did you choose this particular combination for your bathroom remodel? A: We chose this particular combination because we wanted to have an updated look. We wanted to bring the grays and the beige and the creams in but we also wanted to keep with the traditional style of the house. The Brittanicca Gold did that. It brought everything together with this Quartz. Q: What is your favorite thing about the new bathroom? A: My favorite thing about the new bathroom has got to be my quartz countertops. I've loved them from the day they were installed. It just brought everything together for me and I do love my countertops. We ended up getting a 6 foot under mount tub which feels luxurious and the shower size obviously is very nice but I have to say my favorite thing is the countertops. Q: What did you like about using Cambria? A: What I liked about using Cambria was the number of selections that they had. They had a wide variety of different colors, different patterns and also the availably of the slab to come in a 2 or 3 cm. The size of the slab also because we were able to get all of the bathroom done with one slab which was important to me to keep the grain moving correctly and there showroom was outstanding. They had everything there that I needed to see in a full slab out in a showroom for me. There website also. I wanted to get an additional sample, it was sent out immediately. We were just very happy with Cambria.